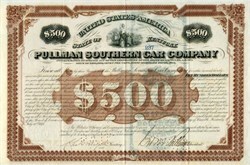 Beautiful $500 bond certificate from the Pullman Southern Car Company incorporated in the State of Kentucky issued in 1876. This historic document was printed by the Western Banknote Company and has an ornate border around it with a vignette of Lady Liberty standing in front of a port. This item is hand signed (boldly) by the company�s president, George Pullman and is over 136 years old. Punched cancelled. American industrialist and inventor of the Pullman sleeping car for use on railroads. Pullman moved to Chicago in 1855, accumulated some capital as a contractor, and began to devise a sleeping car. The first real Pullman car, the "Pioneer," invented jointly with Pullman's friend Ben Field, appeared in 1865. It contained folding upper berths and seat cushions that could be extended to make lower berths. Pullman became president of the Pullman Palace Car Company, organized in 1867, which built sleeping cars and operated them under contract to the railroads. To house his employees he built the town of Pullman, located south of Chicago (and later incorporated in it). The town (much of which is still standing) includes both public buildings, such as the impressive Victorian-style Hotel Florence and a greenstone church, and private dwellings. The paternalistic company-owned town was a widely discussed social experiment.